Home » Texas Rangers » A bright spot. Jeffrey Springs strikes out Ranger-killer Khris Davis in the first inning. If there was ever any doubt from anyone but the most optimistic of rose-colored glasses Pollyannas, yesterday’s 7-3 loss to Oakland eliminates any chance of Texas finishing over .500. It was their eighty-second loss of the season. It will be the Rangers’ third under-.500 finish in five seasons, wrapped around two division championships. Visiting the Athletics has been a house of horrors for Texas the last two seasons. With this weekend’s sweep, the Rangers finished 3-6 this season in Oakland. That’s after a 1-8 “effort” last season. It also appears that the Rangers are headed back into a period of irrelevance. After going ten consecutive seasons, from 2000 to 2010, without a post-season appearance, the Rangers had a nice three-season playoff run going, highlighted by, of course, two World Series appearances. But since The Collapse of 2012, when the Rangers choked up a huge division lead to the Athletics and had to settle for the wild card game, the Rangers have had just two playoff appearances in six seasons. The franchise that cockily declared it was going to build a consistent winner hasn’t been able to do that. Six more series remain in this lost season. Often times you use these waning, worthless games to look for answers for next year. The answers may not be evident but the questions are pretty obvious. It’s all about pitching. One nice solution may be revealing itself, though. Jeffrey Springs had another strong outing yesterday, going three scoreless innings to start the game. The twenty-five-year old lefty was the Rangers’ thirtieth round pick in 2015. With the dearth of pitching anywhere near the major league level, he got a chance to prove himself this year. In twelve games and 22.2 innings pitched, he’s struck out 23 and walked only one, giving up just five earned runs, for a 1.99 ERA. Springs is auditioning for a role in the Rangers rotation for 2019. How the Rangers hit against Barria. How the Angels hit against Minor. 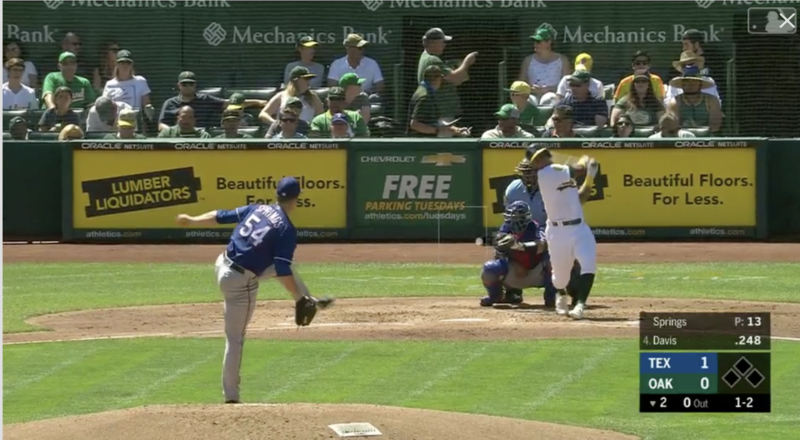 Last year when the Rangers went into Oakland they’d be swept because they faced Manaea, Cotton, and Graveman. This year the A’s don’t have any of those guys but someone the Rangers manage to get swept anyway. Impressive. But what’s really impressive is what the A’s have accomplished this year. No one expected them to do much even when it was expected they’d have the same rotation as last year. If it had been known they’d have none of the big 3 the betting would surely have been that they’d finish last. They saw a huge step forward in Chapman and Olson. If the Rangers can experience that with their young guys it will be huge. Right. When the Rangers seem to miss time and again on them. I am not a subscriber to the notion that you do nothing and let the team rot until it is ready to compete. If I go to a game I would love to seem them have a chance to win it. Yep, that’s my point. So what if they can’t run out and buy a superstar pitcher or fielder or hitter? There are going to be some serviceable, reasonably talented, ML level veterans looking for work next Winter. There always are. People get hired every Winter. And I don’t see any excuse for some of them not being hired to come help out these kids and help fill out a complete roster. There’s just no excuse for starting another season with nothing to show for the off season but a wish and a prayer. Just don’t overwork him before July 31st. The rotation only matters through mid May or so as they have sold the vast majority of ticket packages for the year. After that, anyone that does not figure in the plan for 2020 or 2021 and beyond would be fair game. You know they have to “spin the wheel” on a rotation at least one or two more years. Hopefully one of the younger guys will step up and surprise us! Great . . watch some movies to prepare! I hear JD’s on the phone to see what it would take to get Berria. Well, we are ahead for the time being. Let’s see if we can win this one. Minor didn’t fall apart! This is major! Hey Elk! How are you doing? Good! Busy, but good. Just wish I had better baseball to watch. How are you? Got the kids back to learning something? I wish we had better baseball to watch too! Losing gets old! It feels like we are still in Spring Training, waiting for the season to start. It is going to be a very long off season if we don’t get some good starting pitching. I am trying to get packed to go to Orlando. I got way behind because I have had that awful virus for the last two weeks. I couldn’t go anywhere or think about what needed to be done. Now I am scrambling to get everything done. I am almost in panic mode. Ha! Y’all go every year? You must really like it! No way! We have to scrimp and save just to go about every other year. I don’t buy any fancy shoes, purses, and lots of other things so that we can afford to go, and even then, I know how to go and save the most money. I know all the ins and outs. Yes, we love it! Mr Go and I went there on our honeymoon. 😄. We are coming up on our 25th anniversary. Keep an eye on the Atlantic in case the hurricane takes a left. This could be a bad one. Good grief! I haven’t even had time to watch the news. The last I heard they thought it was going to hit in the middle of the eastern coast, or turn and go up north. It wasn’t supposed to go anywhere near Florida, I thought. Do you know when it is supposed to make landfall? We won’t be there until Friday afternoon. I heard that it has already been raining there almost everyday for about a month and a half. Of course that could have been an exaggeration. I hope it won’t be a soggy vacation, but we have dealt with that before. We need to stop going in September, but that is when they offer the free dining plan. THERE ARE THREE??? Good heavens!! I really hope I don’t have to deal with anything from any of those! Supposed to hit Friday, and yes, it’s supposed to hit the Carolinas, but you never know with these late storms. There’s a wide swatch of possibilities with this one. You’re probably fine, but it’s worth keeping an eye on if you’re going to be in the neighborhood. Ok, thanks! I’ll watch the news after the game. Ha, I have already been to several stores that I have bought ponchos from in the past and I can’t find any. Academy Sports usually has some good ones, but they didn’t have any. I don’t really have time to go shopping, but I have to find some from somewhere. Oh, we will. That’s almost guaranteed. It seems to be very rainy in September. On a normal day it rains for about 10-15 minutes about once or twice a day. When there is a storm in the water, it can rain all day long every single day. That happened on one trip and it was miserable, but at least the hurricane didn’t make a direct hit while we were there. Thankfully I only have one still in school. The other two are in college. In fact, my oldest son is staying home to attend classes. It will be the first trip without him. I am already sad. 😥 College is good though. I really can’t complain about that. My youngest started his first year of high school. They just grow up so fast! Enjoy the time off. Grandkids come sooner than you think! My parents have 11. Both of my brothers have 4 kids each. My oldest son has a new girlfriend, so that sentence is VERY scary!! These games are getting harder and harder to watch. We are ahead for half of the game, then we somehow figure out a way to lose it. Well, at least we got out of it this time.